Our only regret was that we couldn't stay longer. Buddy Oriental Riverside was a lovely oasis in Bangkok--not extremely convenient to major sites, but entirely pleasant with excellent facilities including pools, food, and other amenities. Staff was friendly and helpful and the room was big, clean, and well-appointed. 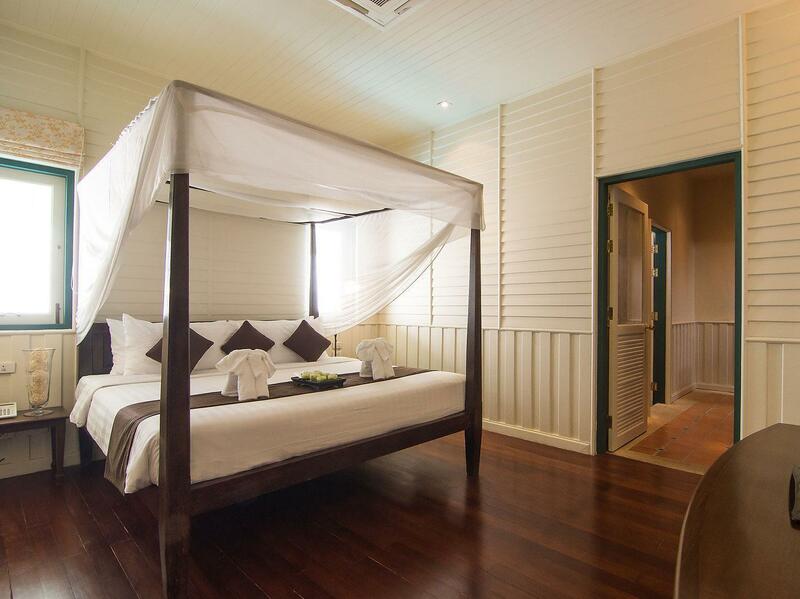 The staff and the room were very nice, clean, big space and well traditional Thai design. Breakfast is good. However, we have changed room once coz we booked deluxe river view but got some part of the pool view instead (not like in the ad photo) and the view of some people walking right in front of our bedroom window around the pool. We had to close the curtain pretty much all the time. Plus it’s right next to 6 air compressors. Super loud lol so we changed. There were 3 weddings on during the whole time we were staying. Our second room was more private and quieter located on the upper level (still no river view) above the hotel main entrance. Every morning of the stay, the guard blew a whistle since before 7am to guide the cars to the car park (wedding=many cars). Anyhow, we told the staff and they organized the whistle wake up call noise to later on. All in all, it’s a nice place but I’m not so sure if it’s a good place for someone who want a peaceful long stay vocation. We booked this hotel to avoid downtown Bangkok traffic. It’s a nice surprise to find this spacious facility by the river. 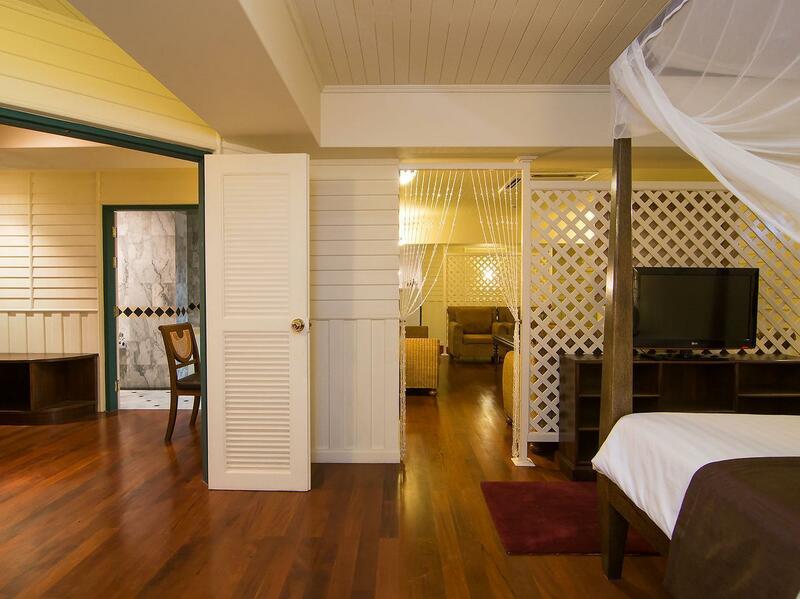 The room is colonial style, with balcony. You can feel the owner’s passion for hospitality every corner you turn. The sunset by the riverside restaurant is stunning. The staff is friendly but with limited English. The accessibilty from main road to hotel entrance is a bit challenge. Bring hotel address and map with you when taking taxi. If you want a qiet getaway; this is the place. I loved the oriental style throughout the whole premises. Rooms as well as complete building, all in oriental style, very very relaxing. Great pools, very nice location at the river banks. Recommend for a great retreat, just minutes away from Bangkok. Staff very friendly ! This was a great place to stay, as I got married literally next door - very handy. The staff were so so nice (typical trait of the Thai folks). Great value and the beds were so soft and comfortable. The only downside which is not unique to this hotel but in most (99.9%) hotels in ASEAN is the breakfast, I'm English and love a proper English breakfast and the shower head would benefit from a bleaching / cleaning, room 301. Our room 321 was not facing the river, so we only had some tree views, which was a bit disappointing at first. But the room size was generous and very clean. Though it was a middle of long weekend in Thailand, there were not many people, so we could have the swimming pool to ourselves. The location is about 40 mins drive from CBD of Bangkok, so you will need your own transportation. We had dinner at a Thai restaurant by the river on the hotel premise, which had a live band and quite nice. The breakfast on the following day was not buffet due to low number of guests (still adequate though). I am quite happy with the stay as our purpose was to relax and the hotel served our needs. The requirements I would like to make is 1.No DVDs are available at the reception (the booklet in the room says DVDs can be borrowed at the reception). 2.No toothbrush. Shampoo/conditioner are of low quality. 3.Room was quite dark with all the lights on. Not great for readers like myself. However, it is overall a great place if you have your own transportation. 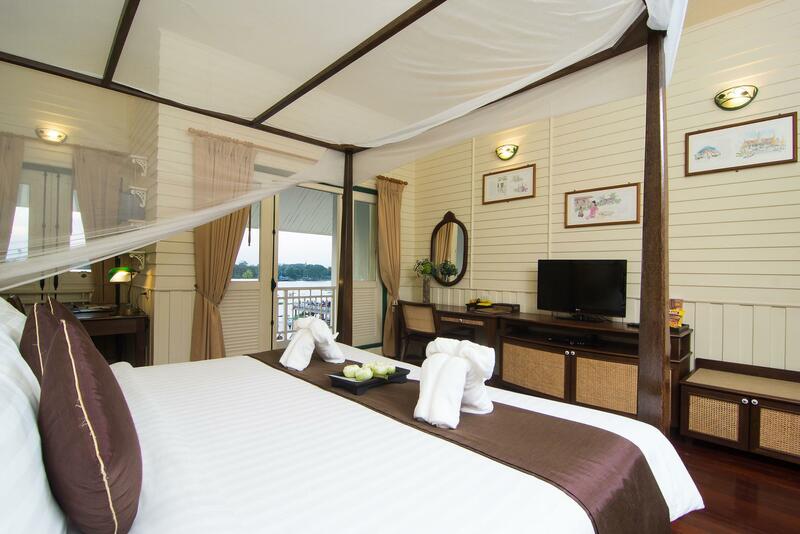 The hotel is located near the river side abs this gives it a peaceful tranquility spot to chill down. The pool villa i stayed in was very nicely decorated in colonial style, clean and tidy. The swimming pool that come with the villa is quite large but should have daily cleaning as its full of trees and gardens so at morning it can be quite a lot of dirt inside the water. Breakfast was for me far from ok, I mean if you like to eat healthy, it's complex as all is mainly focused on very basic breakfast items. Bananas were not available just to give you a idea... To me it was a breakfast worth 3 star only. Went for massage at the resort and must say very professional team and great treatment in cozy room. Overall staff was very friendly, really kind and true Thai hospitality !! 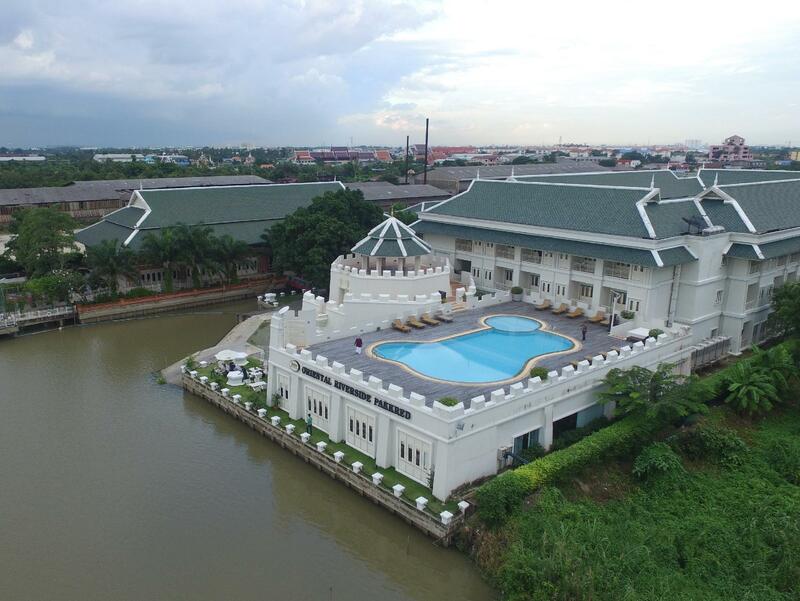 My best friend got married at this resort so my main topic to stay at this resort.. First time visit BKK andwant to book this location to be near the river, it's nice but kind far from all touristic spot. Travelling with two young kids, in the room there is 1 large bed and a single bed. Large bed enough for one adult n two kids to slp. Breakfast wash Simple but sufficient. Cozy place. What a great place. Full of charm. Big rooms, big bed. Just after New Year, we felt as though it was our own private spot. Right on the river. We thought it would be absolutely perfect if they had a taxi boat to go into the city. ( a suggestion for the hotel). Exemplary service. Swimming, massage, the feel of a unique hotel.Huge! But delightful surprises of charm.. Great breakfast. Would go back in a heartbeat.